Nicolas Margeot is the Bar Manager at Carry Nation in Marseille. He makes us two cocktails, one with Gin and Orange Flowers and the second with Rum and Maple Syrup. My name is Nicolas Margeot and I started in the hospitality world 12 years ago after my graduation. First I was more on the kitchen side, but with my social skills, it was not for me. A friend of mine who is a sommelier told me that bartender would be a good choice. So I went to the Plazza Athénée in Paris where I learn to be squared in my work. Then I moved back in South of France and after different places, I work at Carry Nation for the last 6 years, where Guillaume Ferroni became my mentor. Carry Nation is a real speakeasy, so a hidden bar, where you have to book online to know where to go. I like to watch people coming the first time and when they get out of this dark corridor, you can see the stars in their eyes. 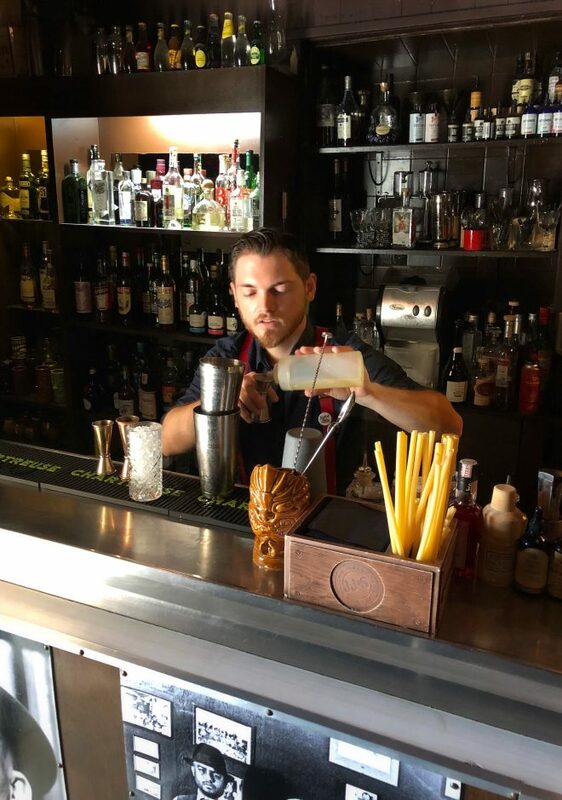 We really focus on the service, the knowledge of the spirits and cocktail products to be able to produce bespoke cocktails when needed. I am a very big fan of High Five in Tokyo regarding the service. So my bar would be for no more than 10 people to take care of them personally. I want to have a bespoke service with no cocktails list. A place when I can work with a lot of rough products, to make people try different tastes from all around the world with food pairing while they listen to jazz music. I try to discover Marseille because I can see tourists know better the city than me. Otherwise, I travel to discover new drinks, food, products. Rum is the one. You can find different types of rums all around the world, so you can make any cocktail with rum. Right now I am a big fan of three rums: Plantation Pineapple Rum, Clairin Le Rocher and the third one is Boucan d’Enfer from Ferroni, casked in a Laphroaig barrel. A good cocktail is related to a moment or a mindset. So most of the time it should create an emotion. After that of course, it’s about balance. But the most important, it’s the one which the client likes. I enjoy using lavender because I am from the South of France. When you made a cold infusion, you have a purple colour which is pretty and aromatic, so it’s perfect for a cocktail. You need to go to High Five in Tokyo and Native in Singapore.